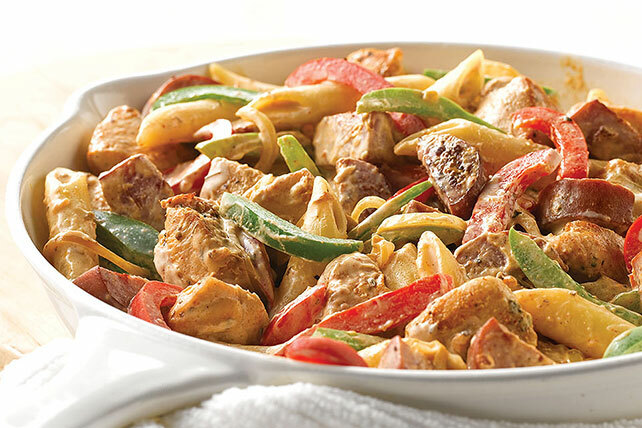 Enjoy our easy-to-make Cajun Pasta Skillet today with bite-size pieces of chicken tossed together with Cajun seasoning, sausage, peppers and onions. Toss chicken with 1 tsp. Cajun seasoning. Mix cream cheese spread and 2 Tbsp. milk until blended. Cut sausage lengthwise in half, then crosswise into thin slices. Heat oil in large skillet on medium heat. Add chicken and vegetables; cook 6 to 7 min. or until chicken is done and vegetables are crisp-tender, stirring frequently. Add sausage; cook 3 min., stirring frequently. Add cream cheese mixture, remaining milk and seasoning; cook and stir 2 to 3 min. or until heated through. For a spicier dish, prepare using andouille sausage. Substitute cooked long-grain brown rice for the penne pasta.